The issue on vinyl of a box set of the EMI Columbia recordings in the Lansdowne series, recorded by Dennis Preston, of the The Don Rendell / Ian Carr Quintet is a special event. Analysing why this group from the 1960s is held in such affection and reverence is no easy task. Long considered as the pinnacle of UK jazz in the sixties, they were like no other group of the time, all their material was original. They resisted the theme-solo-theme pattern of most jazz at the time. They played a different kind of music. At the moment, a single original vinyl LP sells on eBay for over a thousand pounds. The recordings in the Jazzman box cover the period from 1964 to 1969. That period parallels what has become to be called the Great Quintet of Miles Davis. ​It is greatly to the credit of Carr and Rendell that they resisted copying the Davis group. Not only that, they forged a different path just as valid as the Davis route. Shades Of Blue: Blue Mosque; Latin Blue; Just Blue; Sailin’; Garrison “64; Blue Doom; Shades Of Blue; Big City Strut. At this stage an American influence pervades the album. Ian Carr said at the time: ‘We wanted to get as much interplay as we could between the instruments………Clusters are beginning to take the place of solo lines, the sort of thing you get in Coltrane and the very newest things by Miles……. It is exciting to play. We hope that it is exciting to listen to.’ ‘Blue Doom’ has an absence of doom it is an indication of where jazz was at that time: a sharp bop piece with a conventional theme which races along. 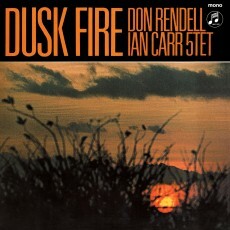 It was written by Rendell and Carr and Carr plays an assertive solo in the tradition. ‘Shades of Blue’ by Neil Ardley shows the quintet’s love of beauty which will be emphasised on subsequent albums. Colin Purbrook’s piano matches the slow languid mood of the piece. 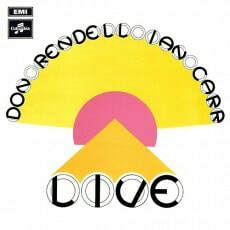 Carr’s trumpet works well with Rendell’s ruminative tenor complementing each other. ‘Garrison 64’ features Rendell’s soprano and Carr’s trumpet playing over each other and over Dave Green’s bass figures; The final track is ‘Big City Strut’ a blues with braggadocio. 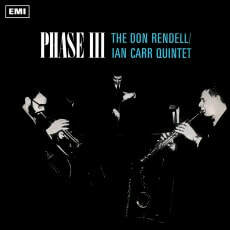 Carr and Rendell both solo with zest and Colin Purbrook matches them with pianistic energy. There are hints in this album about what was to follow but one essential ingredient was missing: Michael Garrick. The contribution made by Michael Garrick to the group is emphasised by his writing. Undoubtedly, he influenced the character of the music, by reducing the American impact and looking to India. ‘Dusk Fire’ written by Garrick has that almost Indo feel that Garrick sometime flowed into his music. Don Rendell plays the soprano which emphasise the ambience of the piece. Carr does not disturb the mood as he plays muted. The hand clapping which accompanies Dave Green’s bass solo also at time sounds like a tabla. Trevor Tomkins, musical as ever, on the drums gradually increases the tension towards the end. Any one listening to this track when it was initially released would realise that this was making different musical statements. ‘Spooks’ starts with Dave Green setting a bass theme. 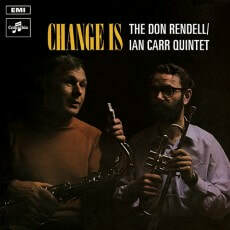 Don Rendell on soprano joins with simple melody echoed by Ian Carr and soon you realise that they have been joined by the piano and the drums of Trevor Tomkins. There really is something spooky about the theme. Garrick's ‘Prayer’ is another slow, beautiful number and is followed by the speedy ‘Hot Rod’ written by Carr and Garrick. ‘Hot Rod’ was popular with the players it was used frequently on their live shows. Garrick noted that it gave way to their more tearaway impulses. 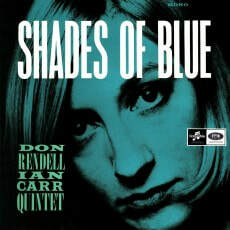 Of all the Rendell Carr albums that I have listened to over the years this is the one that I have returned to most frequently. The transformation was complete. There was nothing like this anywhere else in the world. This was unique music that expanded what jazz could encompass, pushing at the boundaries, not in a screeching avant-garde way but stretching the intellectual boundaries. Ian Carr dominates this album and he composed three of the five pieces. Two of them were inspired by poets W.B Yeats and Francois Villon. They were not completely new, Carr had recorded them before with an experimental quartet. ‘Crazy Jane’ has an assertive theme that is superbly well played. ‘On’ by Don Rendell is high speed and together with the first track is an exciting opening to the album. Rendell’s solo is one of his best marginally closer to Lester than Coltrane. Trevor Tomkins kicks the whole thing along. Throughout this album Carr plays at his best, completely assured. Sometimes diffident about his ability, here he plays without doubt. Les Neiges D’Antan (The Snows of Yesteryear). This is probably the most beautiful composition on all five of the albums. It has all the characteristics that make the music of the quartet so memorable: space, beauty intelligence, originality, the courage to diverge, the refusal to conform to the usual jazz rules, a nod to European classical music and an impishness. Rendell’s ‘Bath Sheba’ is flute and flugel and the most conventional piece on the album... A gentle piece, Rendell plays a second-hand wooden flute that he had recently acquired. Michael Garrick has his idiosyncratic take on the theme almost waltzing at one point and duetting with Green. ‘Black Marigolds’ by Garrick is based on an Indian story and the influence of Indian music is clear, Rendell plays soprano and Trevor Tomkins plays hand drums, Dave Green plucks out repeated bass figures. Garrick plays with freedom and almost uses the piano like a tuned drum reaching for the high notes and making them ring out. At over thirteen minutes this whole piece coheres. Rendell’s soprano playing verges on the ecstatic before the interlude of Green and Tomkins. Someone obviously said that the group sounded so much better live so an audience of around forty people was as invited to the studio. Garrick starts with his piece ‘On Track’ and he whips up a climax before handing over to Carr who is at his most playful and lucid. The intricate soprano solo from Rendell cuts through the steady pulse of the rhythm. Rendell was often said to have been influenced by Coltrane. It is detectible in this solo. ‘Vignette’ by Rendell sounds as though it could have been used in a film noir. The way that clarinet and trumpet work together conversationally is compelling. ‘Pavanne’ is stately and underpinned by Trevor Tomkins who co-wrote the piece with Carr. Carr explores the lower reaches of the trumpet and moves gracefully around the instrument. ‘Nimjam’ releases the group to shout out as if to show that they were not all about musical romanticism and spatial awareness. Carr and Rendell solo with intensity and speed. Garrick musically runs his way through, never losing his individuality. ‘Voices’ by Garrick has flute from Don Rendell, playing softly against Carr’s muted trumpet played beautifully against Dave Green’s bass. This is all mood until the tempo is imperceptibly raised substantially by Tomkins and Green. Garrick enters quietly and changes the tempo yet again introducing figures only to discard them as he looks for ways to build his solo. The tempo changes yet again during Rendell’s flute solo. The final track written by the two leaders. ’You’ve Said It’, has in the centre of the piece are two remarkable segments. Rendell is just accompanied by Dave Green’s bass while Carr plays over Tomkins’ drums. Captivating. You can hear the change immediately as the two basses duet throughout ‘Elastic Dream’. Jeff Clyne guests with the group on this track as does drummer Guy Warren. Mike Pyne on piano wrote this piece which is a more conventional blues. Ian Carr’s confident soloing illuminates the track with his incisive sound. Don Rendell shows the Coltrane part of his nature. The other solo here is by tenorist Stan Robinson making his first appearance on record. ‘Boy Dog and Carrot’ is pure Rendell Carr, the abstract opening giving way to a rocking theme. It is a given with this group that you are never sure where they are going next. Ian Carr solos on flugel horn and his solo is riveting. Michael Garrick plays the harpsichord inventively. Guy Warren is on maracas. ‘Cold Mountain’ is based on a raga. It is inspired by a hermit who lived on a mountain. The stark atmospheric theme has an ascetic quality. Don Rendell uses his soprano to create a music that is jazz that goes beyond jazz which is one of the qualities that drew people in to this group. The gradually increasing pace of the piece builds to a kind of whirling dervish excitement like building to a kind of ecstasy. Dave Green finishes the piece with his bass sounding a like a sitar. This was the final album. The introduction of Guy Warren was not popular with all the group members and caused some dissension. Carr had started to believe that the creativity that had been such a part of the quintet’s work was almost exhausted and he was looking at new developments. Don Rendell came to this group with a wide experience. His early love of Lester Young was important; he had even accompanied Billy Holiday on a short UK tour. He had also worked with Kenton and Herman. Around the time of these recordings he had grown to admire John Coltrane. At the time of these recordings he had outgrown his early influences to become himself. ​Green was and is one of the great jazz bassists. His eclecticism can be judged by the range of people he has played with: Humphrey Lyttleton Lol Coxhill Coleman Hawkins Sonny Rollins Roland Kirk and Stan Tracey. His sound is deep, rounded and at times forceful. He is always a reassuring presence, a foundation. Ian Carr arrived in London in 1962 from Newcastle. The Rendell Carr group was formed in that year. Carr had a slightly more intellectual take on life than most jazz musicians of the time. This was shown in his willingness to eventually choose to set up the Nucleus group and to develop his writing by producing books on Miles Davis and Keith Jarrett. His trumpet and flugel horn playing evolved across the life of the quintet. ​The contribution of Trevor Tomkins to this music tends to be overlooked. He was as essential as any member. Drumming was changing in the 1960s. Tony Williams had shocked the jazz world by joining and commandeering the Miles Davis group when he was just seventeen. Compared with Williams who tended to dominate, Tomkins has more subtlety and uses a wider range of effects. He could, difficult for a drummer, be self effacing when it was necessary. His rhythmic sense lifts the group especially in some of the faster pieces. The contribution that Michael Garrick made to the group was not recognised enough. He approached jazz piano in a completely unique way. He is very English at times almost liturgical. He defined their identity and shaped many of the albums with his personal international vision. This box set of vinyl copies from Jazzman Records is accompanied by a booklet containing new sleeve notes by the biographer of Ian Carr, Alyn Shipton. This is the first vinyl re-issue. The masters, now owned by Universal Music, were used to create audiophile quality 180 gram pressings. Replica artwork of each sleeve was produced and included in the box. The original recordings were engineered with great fidelity. HD downloads are currently available from hdtracks.co.uk, acousticsounds.com and highresaudio.com, each site having its own regional restrictions.